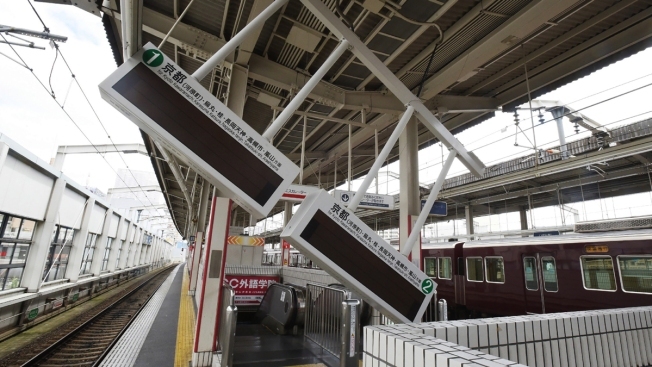 Train guide electric boards tilt following an earthquake at Ibaraki-shi Station in Ibaraki City, north of Osaka prefecture on June 18, 2018. A strong quake hit western Japan early June 18, but there were no immediate reports of major damage or risk of tsunami waves, officials said. Residents in western Japan were cleaning up debris Monday evening after a powerful earthquake hit the area around Osaka, the country's second-largest city, killing four people and injuring hundreds while knocking over walls and setting off fires. CORRECTION (June 18, 2018, 3 p.m. ET): This story has been corrected to say the quake struck shortly before 8 a.m., not after.